Beekeeping workshops at Blue Pearl Farms are intensive, information-rich and hands on, providing you with the information you need to learn about the world of bees, begin your own beekeeping practice, or move forward with your practice after your first year as a beekeeper. Small classes. Bees bringing in pollen, blueberry buds swelling, all kinds of birds coming by the farm, and even the workshop schedule say spring is definitely on the way. Saturday, January 31, 10 am - 2 pm: still a few seats available for our Beginning Beekeeping Workshop, intended to help you prepare for your first hives. All workshops include a light lunch or snack, honey-tasting, reference materials, and all the questions you can ask. Please visit our beekeeping page for more information, or contact us at info@bluepearlfarms.com with specific questions. To register for the course, please go to our online store. 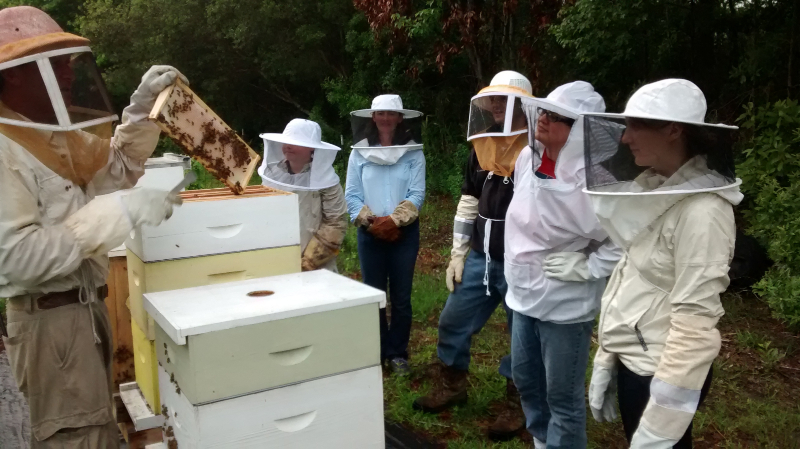 Write to us if you are interested in finding out about our Advanced Beekeeping workshop for beekeepers who have kept bees for at least a season in February and want to learn about splitting hives, building queens, and maintaining a healthy apiary. Saturday February 21, Sunday March 1, Saturday March 21 are additional beginning beekeeping workshop dates. A special family-oriented workshop focused on introducing the world of bees and beekeeping is scheduled for Sunday, March 22. Where can you find Blue Pearl? Farmers markets begin again in April, but until then, you can find pure, raw, and 100% Blue Pearl Farms honey at our new online store, along with our products of the hive from beeswax candles to Brittle Buzz and Buzz Cream. If you haven't tried Buzz Cream at a market, have a look at a link one of our Atlanta clients sent us after choosing it as her Shiny Penny of the week. We use our own beeswax & honey and natural plant oils to make a moisturizer for men and women that is free of added scents, alcohol, chemical preservatives, and petroleum products. Finger Buzz has more beeswax, and helps to soothe and heal cracks in fingers, heels, lips and more. Looking for live, wild-harvested Atlantic blue crab? Contact us at the Pearl: info@bluepearlfarms.com or 843-887-3554. We are out several times a week in the waters off McClellanville, selecting the best available. Just ask the pelicans.